Wednesday January 1st 1902 I sewed a little after doing the morning work. Dell went to the timber for the day and Will and I went down to Otts for dinner. The Ashleys are there. It was a day pleasantly spent the only down tick was Ott did not feel well enough to enjoy the dinner. 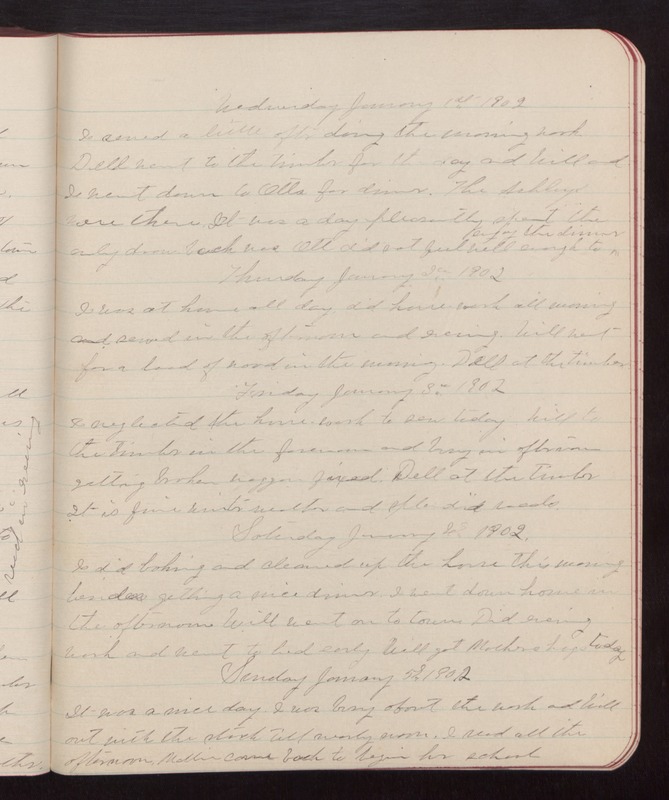 Thursday January 2nd 1902 I was at home all day, did house work all morning and sewed in the afternoon and evening. Will went for a load of wood in the morning. Dell at the timber. Friday January 3rd 1902 I neglected the house work to sew today. Will to the timber in the forenoon and busy in afternoon getting broken waggon fixed. Dell at the timber. It is fine winter weather and splendid roads. Saturday January 4th 1902 I did baking and cleaned up the house this morning besides getting a nice dinner. I went down home in the afternoon. Will went on to town. Did evening work and went to bed early. Will got Mothers hogs today. Sunday January 5th 1902 It was a nice day. I was busy about the work and Will out with the stock till nearly noon. I read all the afternoon. Mollie came back to begin her school.